Do you know the story of Little Red Riding Hood and the Big Bad Wolf? If you've never heard it before, ask your Mummy or Daddy to read it to you - it's a really good one! This picture is looking a little bit pale though, and Little Red and the Wolf need brightening up. Can you print out the picture and colour it in? 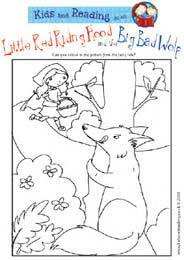 Why not Download the Little Red Riding Hood Colouring Sheet and see how colourful you can make it. This activity is aimed at 3 to 7 year olds, it's a fun way to raise your child's interest in words and stories, as well as building their creative skills.